Since it's Holiday, and I have no work today, I got a time to cook again. Thankfully, this is getting a lot easier for me to do now, given that I'm stating to somehow memorize the ingredients as well as the directions on how to prepare such dish. 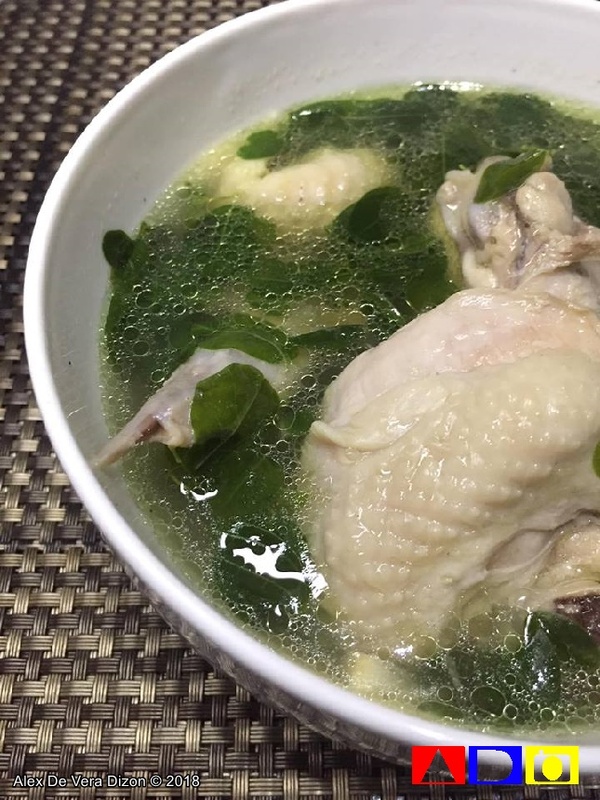 And for this day, which I called Chicken Fake Friday, I cooked one of my favorite dishes that my mom thought me how too cook, as well as something that's easy to cook but equally delicious. Maybe if I'll have more time next time, I'll try to come up with easy-to-cook dishes that can be prepared by anyone reading my blogs. Moms would agree to time that chicken is one of those meats that is easy to cook. And since it's rich in protein, this is actually a good source of vitamins and nutrients. I'm actually planning to cook Chicken Tinola only, but since we have a 5-year-old girl in the family, who tends to be picky now and super loves Tocino, I opened up the fridge to prepared this Chicken Tocino by King Sue. 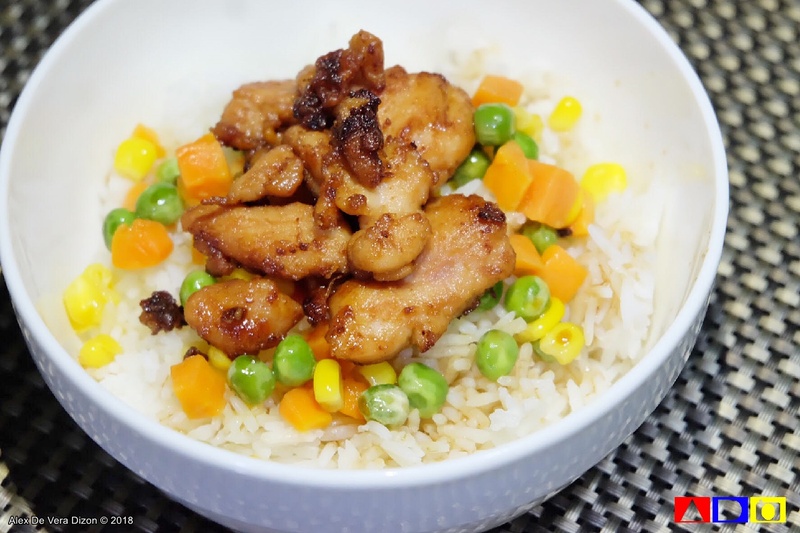 If you know how to cook Pork Tocino, Chicken Tocino is no different, actually. But this is quicker to prepare. In less than 5 minutes, you already have this dishes ready and looking good. But good is not okay with me, so instead of just having this King Sue Chicken Tocino in a plate, and since I have an extra packed of frozen mixed veggies, I cooked some in a butter, and in less than a minute, I already have this steaming some sort of Breakfast Meal ready to devour. And guess what, my 5-year-old niece loved it! You can get a pack of this King Sue Chicken Tocino in all leading supermarkets. It is currently retailed at Php67.00 per 250 grams. For those who are looking for giveaways this Christmas, one of the top gift items given nowadays are the gift of food - and a King Sue ham, for instance, is a great give-away that will be appreciated by everyone. I remember a few years ago, I bought like a dozens of round hams in the supermarket to give to my Titos and Titas as Christmas gifts. To my surprise, they loved it and enjoyed it during New Year's Eve celebration. One thing that I loved about this idea was since there's no need for some fancy wrapping because it comes with its own gift bag - I somehow saved time in wrapping gifts as well as money in buying gift wraps and tags. King Sue has three variation of hams - the Hawaiian Ham Christmas Loaf is a top favorite, so is the Pear-shaped Ham that is budget-friendly but rich in flavor. 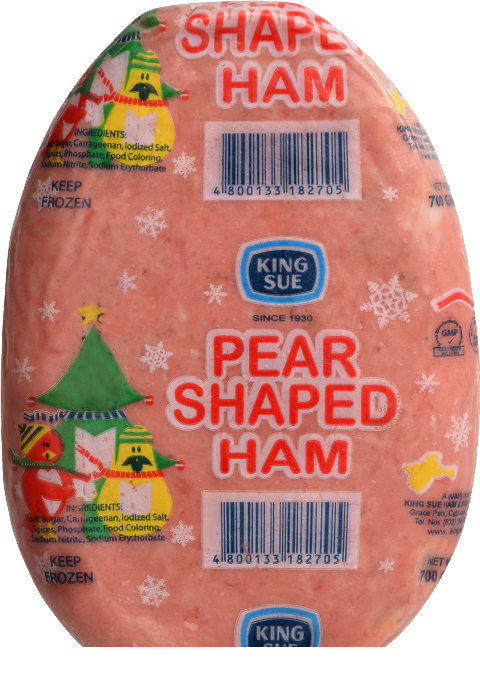 There's also the King Sue Piña ham, which is crafted from of a solid piece of boneless ham leg with absolutely no extenders. 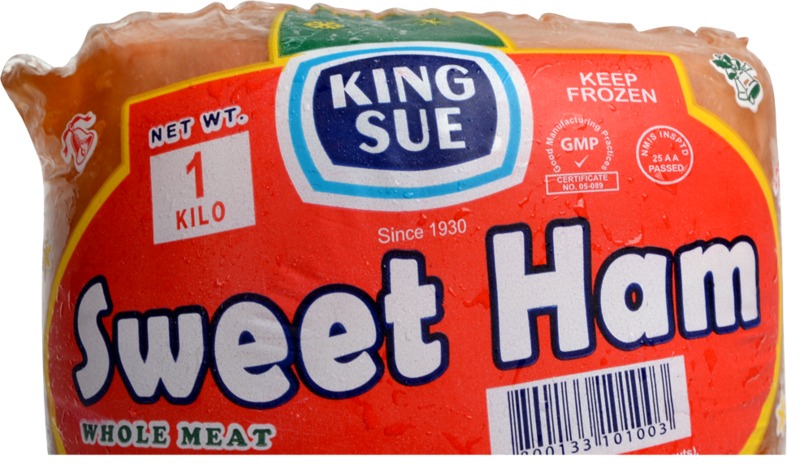 If you want to extend more sweetness, the King Sue Sweet Ham, crafted from a solid piece of premium pork, the most kid-friendly of the whole selection because of its sweet-enough, good-enough taste. But of course, it’s loved by adults as well! This versatile ham could also be an ingredient in sandwiches, pizzas, pastas and other dishes. 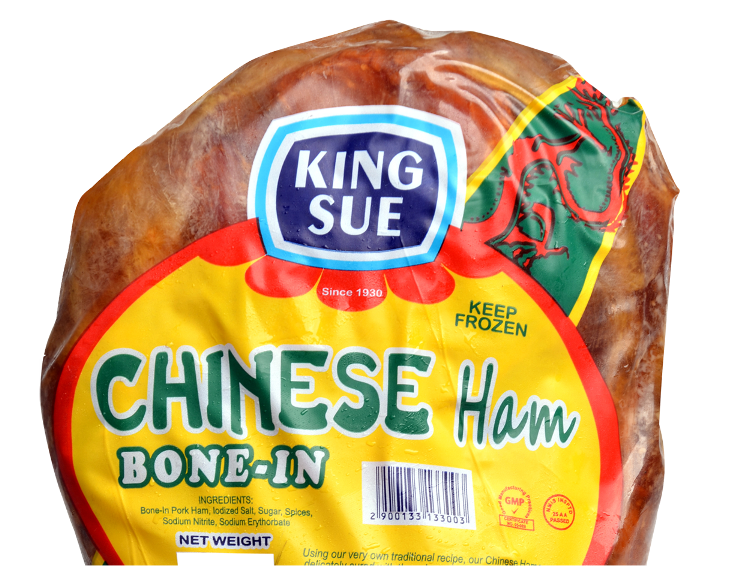 If those are not enough, the King Sue’s Chinese Ham Bone-in made from premium quality pork leg shares a sweet caramelized finish. Each leg is cured for 30 days, smoked with imported wood chips for four to seven days then cooked for one day in a special brine. The skin is then removed and the surface torched with a sugar coating. Should you wish to make your own Christmas basket, you may visit kingsue.com and check of other products such as bacons, sausages, sliced ham and cold cuts, chorizos, deli-burger, corned beef, pork and chicken tocino and sisig among others. No doubt about it, King Sue is a delicious greeting one could give and receive this special season.